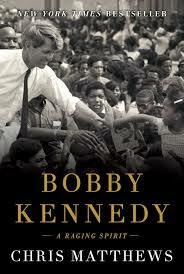 Bobby Kennedy: A Raging Spirit was a solid book by Chris Matthews on the United States Senator and Attorney General under his brother John F. Kennedy and who was assassinated in 1968, eighty days after announcing his run for the presidency, and five years after JFK killed in Dallas. Matthews hosts Hardball on MSNBC and chronicles well Kennedy's life, skill at getting things done and concern for those less fortunate. It's noted how after the assassination, Kennedy's body was carried from New York to Arlington National Cemetery in Washington via train, with an estimated one million people, few well-off as Matthews put it, lining the tracks to pay their respects. Kennedy's early political work was on behalf of his brother, starting with him serving as JFK's campaign manager in a Senate race, and continuing up to the November 1963 shooting of the President in Dallas. In their work together, Bobby was often the driving force behind things, and while Attorney General in the White House, Bobby's morals and being on the right side of history was evident, with the two of them starting what would later get signed as the Civil Rights Act of 1964. After the death of his brother, Kennedy won election to the Senate in 1964, and felt compelled to run for President in 1968 due to both his opposition to the Vietnam War and view of civil rights and the under-represented. Kennedy's speech in Indianapolis the night of Martin Luther King's death is pointed to as an example of his humanity and moral compass and a fundamental idea that he put forth in his all too short presidential campaign was the important ideal that America is great, and should also be good.